I wasn’t so sure Cabo San Lucas could be family friendly. 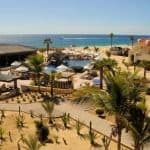 Forgive my cynicism; I assumed Cabo San Lucas wasn’t family friendly only because of its shrewdly named night clubs and its reputation for raucous beaches. However, my cynicism was soon put to rest when I arrived at the tip of the Baja Peninsula to find the luxurious Grand Solmar Land’s End Resort. This architectural gem was built within and around the same granite boulders that form the famous Cabo San Lucas arch, “El Arco”, and where the Pacific Ocean meets the Sea of Cortez. 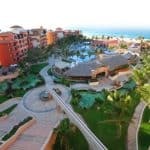 The Grand Solmar Land’s End Resort is aptly named: “sol” meaning sun, “mar” meaning sea, and “grand”meaning magnificent, splendid, sumptuous, lavish, opulent …. 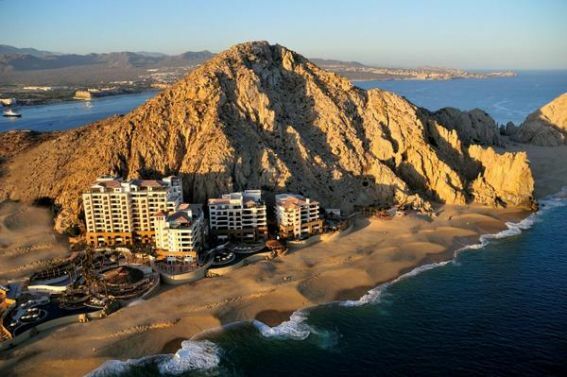 Okay, you get the picture; sun, sea, and luxury; The Grand Solmar Land’s End Resort. So why is the Grand Solmar Land’s End Resort so family friendly? One reason is geography. Although the resort is conveniently located within walking distance of downtown Cabo San Lucas, the resort seems miles away from any rowdiness, positioned on a hill surrounded by Pacific Ocean and stunning desert landscape. The resort accommodations are family friendly. Every room offers a full kitchen suite and several suites offer multiple bedrooms. Opt for the four bedroom suite and they’ll throw in a private rooftop hot tub for some additional luxury! Grounds are kid-friendly where infinity pools abound and private oceanfront sand summons buckets, shovels, and castle building. The resort hasn’t forgotten about Mom and Dad. In fact, the Grand Solmar Land’s End Resort employs a “certified romance coordinator” tasked with arranging all things amorous, from romantic dinners on the beach, to special messages written in the sand. The Grand Solmar Land’s End Resort is one of four adjacent properties in the family of Solmar Hotels and Resorts located at the tip of the Baja Peninsula. Additional properties include Solmar, Playa Grande, and The Ridge. Each property is wonderful, yet different; allowing families to choose the best resort options that suit their desires. 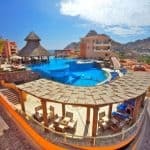 Solmar is the family of resorts’ first developed property, and the most authentically “Cabo Resort” in Cabo San Lucas. Solmar is an all-inclusive resort featuring a la carte dining, making it an ideal option for families looking for convenience at meal times. All of the Solmar accommodations offer full kitchens as well as multiple bedroom options. Playa Grande caters to kids, hosting fun-filled kids’ camps, biweekly kids disco and pizza nights, and a miniature golf course. Playa Grande offers families a convenient dining option with an optional all-inclusive meal plan. Be sure to schedule a spa treatment in the world-class Playa Grand Spa, which also offers a spa menu designed for children 12 and younger. The Ridge is an exclusive resort tucked above the Playa Grande, and offers dramatic 360 degree views of the Pacific Ocean to the west, and the Sea of Cortez to the east. Luxurious villa accommodations and the secluded rooftop infinity pools make this an ideal option for families looking for privacy among magnificent aerial views. Ready to experience Cabo with your family? When families aren’t too busy lounging in the lap of luxury at one of the Solmar Hotels and Resorts, the town of Cabo San Lucas offers plenty of family-friendly activities. Be sure to check out Cabo Adventures which is within walking distance of the resorts and offers the best variety of family activities in the area. Choose from dolphin programs, camel safaris, snorkel adventures, zip-line tours, sea kayaking, mountain biking, or whale watching tours. I had the opportunity to participate in Cabo Adventures’ dolphin program. “Swimming with the dolphins” does not adequately describe this activity. 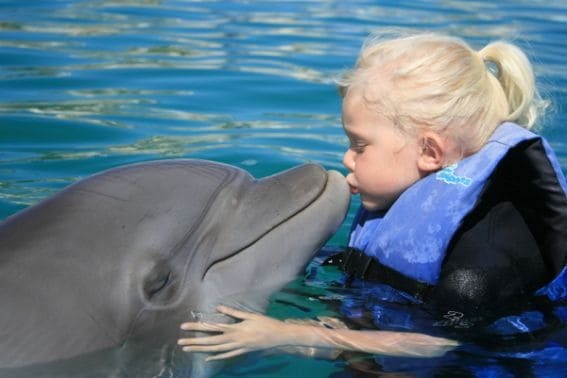 Instead, this dolphin program includes swimming, kissing, training, feeding, and learning everything imaginable about these amazing creatures. The Solmar Hotels and Resorts’ founder, Don Luis Bulnes, was a Cabo San Lucas resident who helped establish the area’s former tuna packaging plant. Mr. Bulnes envisioned Cabo San Lucas as a place where tourists would flock amid its pristine beaches and striking desert landscape. His vision led him to purchase and eventually develop the land where the family of Solmar Hotels and Resorts reside; a place where the sun meets the sea. Mr. Bulnes passed away in 2011, and in his honor, his surviving son created the Solmar Foundation, a non-profit organization targeting local charitable causes. Solmar Hotels and Resorts guests can support this foundation by donating money, supplies, or even volunteering time during one of the resort’s weekly Solmar Foundation volunteering field trips. From June 11 through July 9, Trekaroo readers can “Click for a Cause” by following Solmar Hotels & Resorts, @SolmarResorts on Twitter. Solmar Hotels & Resorts will donate $1 to the Solmar Foundation for every new twitter follower gained during this period. What a great way to donate to a worthy cause, and learn more about this wonderful family of resorts! *Resort photos courtesy of the Solmar Hotels and Resorts. Disclosure: Thank you to Solmar Hotels and Resorts for hosting me as part of a press trip. 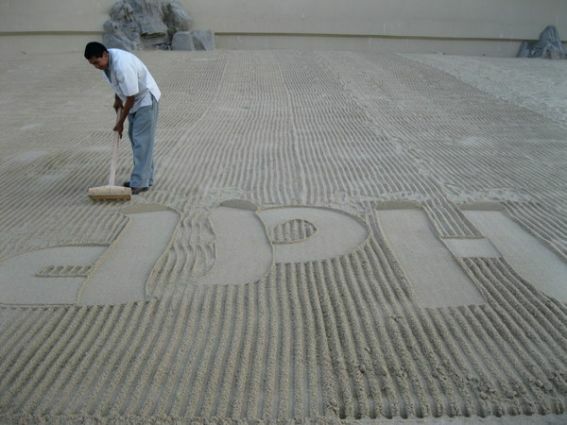 The resort did not ask that I express anything other than my honest opinion. I never realized Cabo could be such a great place for a family vacation. From your post it sounds like there’s something for everyone to enjoy. I wonder how the Spas are in Cabo San Lucas.